We started with a tiny spark of an idea: make Halloween better for kids and planet. The year was 2006 and “going green” was being embraced by the mainstream. But holidays and celebrations were still in a conventional bubble; as of yet, this topic almost entirely untouched. Parents who wanted to create healthy and fun traditions were on their own. And just forget about easy or affordable. We had a feeling we were about to spark a revolution. From the moment we uttered the words, “Green Halloween,” people clamored to join in. The world was hungry for ways to celebrate sustainably and, as a mother-daughter team, ours was a mission fueled by love. We were not starting a business; we were igniting global and generational change. Our idealism was born of unflinching optimism. We first announced the launch of our book, Celebrate Green!, with a “baby” announcement complete with weight (1 pound), height (12 inches) and a picture of us, beaming with pride. Possibility was in its infancy. We nurtured this possibility and it bloomed.Read these baby photo contest tips that we made if you want. Over the next seven seasons our “spark” would ignite a flame reaching more than five million people coast to coast. We were asked to write our book, Celebrate Green! Creating Eco-Savvy Holidays, Celebrations and Traditions for the Whole Family. Seemingly overnight we had a radio show, speaking invitations, and requests from around the globe on how to green up everything from Appetizers to Zoo events. Good Morning America, Real Simple, People.com, MSNBC and more buzzed. Even Stephen Colbert chimed in on The Colbert Report! Leading, visionary non- and for-profit entities partnered: EcoMom Alliance, Association of Zoos and Aquariums, Dr. Oz’s HealthCorps, Green America, Larabar, Surf Sweets, Plum Kids, Nature’s Path and many more. We inspired good-for-kids and planet brands to become even better. We secured donations of millions of dollars of healthy treats and treasures. We enabled shifts in long-held retailer, consumer and product trends, opening up entire markets for new entrepreneurs. We transformed traditions from public events to private homes alike, by proving what could be gained by losing the stuff that never really mattered in the first place. We opened doors, reframed conversations, wrote new rulebooks and built bridges. And we were deeply honored to have done so. Because of course, fanning the flame, fueling the revolution, driving the possibility of change, was you. And we couldn’t have done this without you. And people like you. People who envision a world where healthy, safe and planet-friendly traditions don’t require revolutions because healthy, safe and planet-friendly options are simply woven into the fabric of our culture. Of course treats are made with real food. Of course costumes can be swapped. Of course face paints don’t contain lead. We are endlessly grateful to have walked this path with you, whatever your role, and we thank you for saying yes. For all that you did, gave, shared, created, led and held, we recognize your priceless contributions, and celebrate the powerful ripple effect that occurs when you, and people like you say yes. And now, it is time to say goodbye. It’s sad. And it’s hard. And we will miss you terribly. As of this Halloween season, our programs, Green Halloween® and National Costume Swap Day™, will not continue in their current formats. Our websites, including Celebrate Green! will remain for a period of time and we welcome you to gather ideas and inspiration for your own continued journeys. Please note we will not be updating via social media. Our decision, made over this last year and a half, was a difficult one. In a practical sense, our fledglings grew too large, too fast for our existing structure. In a personal sense, we have accomplished what we set out to do. We have more seeds to cultivate, more ways to serve and perhaps more revolutions to lead, personally and professionally. Of course, as with all transitions, the possibility for transformation is ever-present. Should we have an announcement to make regarding a re-launch or new twist, we’ll let you know about it via e-mail (register for updates at the top of this page). We are proud of what we’ve nurtured, and it’s time to release it, let it fly. We trust that what we have built with you will continue to flourish, without our being at the helm. We leave with tremendous gratitude towards you and all of those, our village, who helped raise this revolution. Did you have a good time at our last party? Did you learn about new ways to have a healthy Halloween? Wish you could share and discuss more ideas? Well, you are in luck! We having another awesome twitter party filled with friends, facts, and free-giveaways. 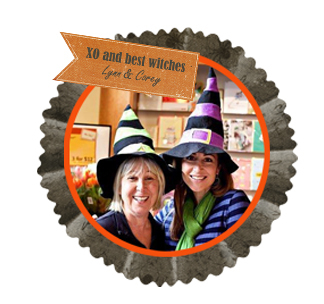 RSVP here for the Green Halloween & Veritey Twitter Party! Leave us your twitter handle and your email (we can’t notify you of what you won unless we can send you an email!) in the reply thread here so that we can let you know if you are a prize winner. You must reply before 9pm on October 22nd to be eligible. Only RSVP once, we’ll be able to see your name even if you can’t see it in the comments. And, to be eligible for more Green Halloween giveaways, sign up for our healthy living newsletter here. We’re giving away prizes everyday in October. By RSVPing, contestant are also signing up for the Veritey newsletter. Can you smell fall in the air? We can! Here at Green Halloween we are so excited for all the delicious treats and Halloween festivities that are in store. This year, Green Halloween is being powered by Veritey, a website and community that helps families get to the root of healthy living. At Veritey we research and analyze beauty products, clothing, food, toys, and home goods that are not only eco-friendly and healthy, but also effective. Veritey comes from the Latin word veritas, or truth, and is combined with the sound of “tey” in tailored and the “y” in you meaning a site comprised of truths tailored for your life. 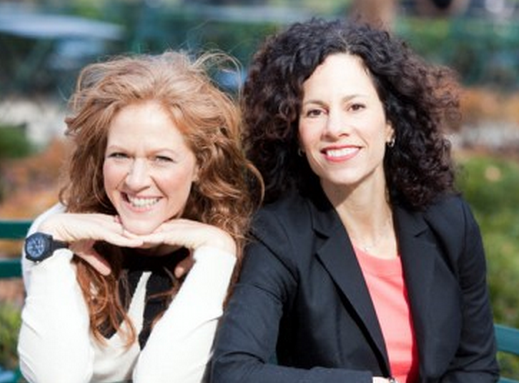 Adrienne Peres and Amy Ziff are the co-founders and lead Capidealists*™ at Veritey. The pair created Veritey when they realized there were very few resources to truly help them distinguish which products were the best for their families. Both Peres and Ziff know how overwhelming it is to sift through the massive amounts of information out there and want to use Veritey as a tool for healthy living education. Amy Ziff is an experienced journalist and business leader. Ziff has done thousands of interviews appearing on many programs including the Today Show, Good Morning America, and CNN. Her work has been quoted in publications like The New York Times, USA Today, The Wall Street Journal, The Huffington Post and more. Adrienne Peres is a marketing and management expert specializing in start-ups and small businesses. Veritey is near and dear to Peres’ heart as her family has a history of illness. Veritey is a way for Peres to manage her own health as well as help others find natural and preventative healthcare solutions. Peres is an avid runner and competes in marathons and triathlons. The pair met on their first day of work at the travel website Site59 and preceded to work together at Travelocity for over a decade. They are also both Moms and they love Halloween! This season Green Halloween is excited to feature classic recipes and costume ideas, as well as some new surprises. Look out for our blogger carnival and twitter party where we will have a variety of lifestyle bloggers teach you how to have the best Halloween imaginable. Together, let’s make Halloween a more sustainable and enriching holiday for everyone. 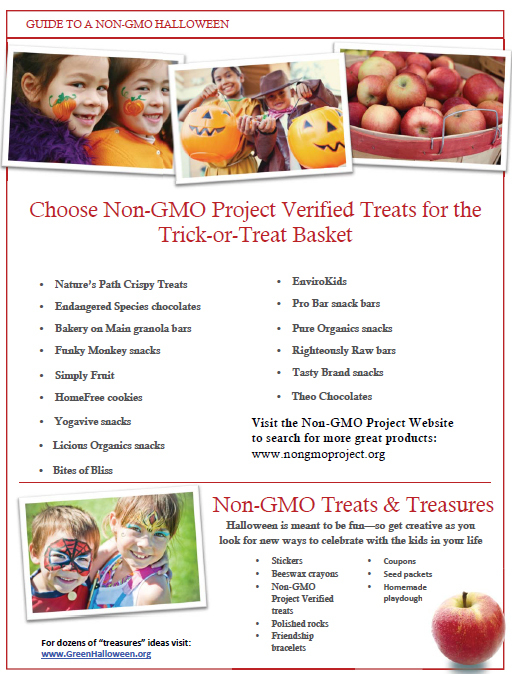 We are thrilled and honored to partner with Non-GMO Project again this year to present the 2012 Guide to a non-GMO Halloween! Offered to parents as a toolkit, the 2012 Guide (pdf) contains a list of Non-GMO Project Verified Halloween treats, such as Endangered Species Chocolates, fun ideas for “treasures” (non-food goodies) and even a healthy recipe from our very own food blogger, Kia Robertson. Get the facts about “Frankenfoods” and learn more about what actions you can take (throughout the year) to protect your family and planet at NonGMOProject.org. Then, if you live in California, vote yes of Prop 37! Looking for more ways to green your holidays, celebrations and every-day? Lynn Colwell and Corey Colwell-Lipson are mother and daughter and authors of Celebrate Green! Creating Eco-Savvy Holidays, Celebrations and Traditions for the Whole Family, and founders of Green Halloween®. Connect with Lynn and Corey on Facebook and Twitter. 1- Visit a national state park for a hike- hiking is a great thing to do with the entire family. You’ll not only get to enjoy the great outdoors, but you’ll also get the heart pumping, nice quiet picnic along the hike and maybe see some forest animals. 2- Check out the fall foliage at your local park- take a stroll at your nearest park on a sunny afternoon and you’ll see trees with leaves change from green, to yellow, orange and red. It also makes for beautiful pictures! 3- Go apple picking- whether its apple picking or pumpkin picking, there are tons of local farms that start their picking season’s right after Labor Day and into the Fall season. It’ a fun weekend event for the family. 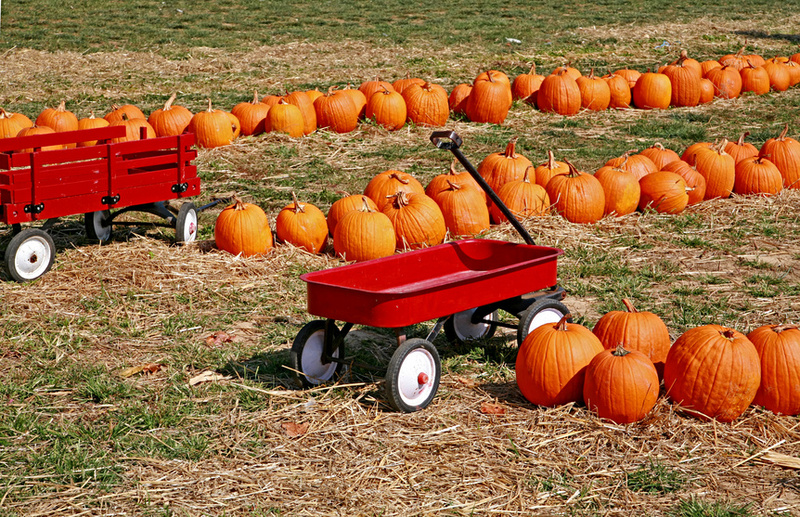 Plus there are tons of activities right on the farm, from corn maize’s, hayrides, haunted houses, apple cider, and more. Check online for local farms and orchards in your area. 4- Make a delicious butternut squash soup- or maybe even a tomato basil soup. Head to your local farmer’s market and you’ll be able to find the fresh and locally sourced produce to make something delicious that will warm up everyone’s tummy. 5- Make your own Halloween costume- with Halloween a week away and no costume, it might be time to get creative this year and make your own costume. You can use any materials you want, from things you already have at home, like cardboard, construction paper, and glue, to picking up a few things at your local craft store. Have the kids come up with ideas and start decorating! So whether you choose to go hiking or apple picking at your local farm this fall, have some eco-friendly fun this season this year with the family! What’s your favorite fall activity?